Gartner names Box a Leader in Content Collaboration Platforms. Again. At Box, we build our products to meet the demands of the digital age, including the need to give your teams a user-friendly way to collaborate without compromising on bulletproof security, control and compliance. Today's best-of-breed world means you get to choose the best tools to solve for these needs — and the future of the digital workplace starts with a single content platform that brings all of your people, information and applications together. This is our vision for Cloud Content Management. We are honored to be recognized as a Leader by Gartner in the 2018 Magic Quadrant for Content Collaboration Platforms — for the fifth year in a row. Gartner evaluated 14 different vendors, based on their completeness of vision and ability to execute and gave Box highest scores for Vision among the Leaders. Today's Content Collaboration Platforms go beyond EFSS to drive the digital workplace. Box offers a complete set of capabilities — including workflow, metadata management, content collaboration and intelligent services on a scalable, secure public cloud platform — that have helped 85,000 businesses accelerate their digital transformation. To see which Content Collaboration Platform is right for your business, read the full report from Gartner. 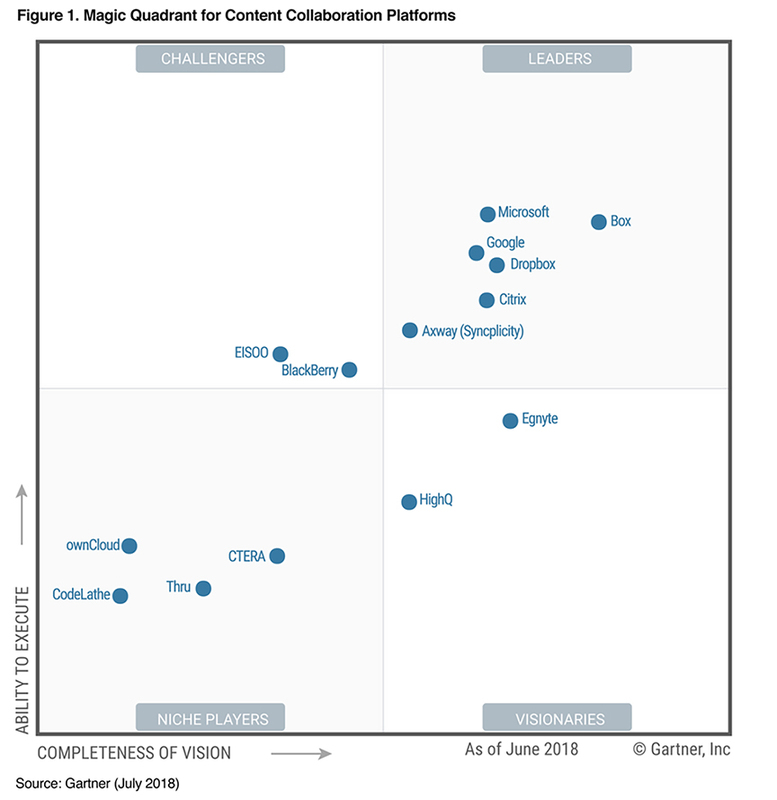 Gartner Magic Quadrant for Content Collaboration Platforms, Monica Basso, Michael Woodbridge, Karen A. Hobert, 9 July 2018 This graphic was published by Gartner, Inc. as part of a larger research document and should be evaluated in the context of the entire document. The Gartner document is available upon request from Box. Gartner does not endorse any vendor, product or service depicted in its research publications, and does not advise technology users to select only those vendors with the highest ratings or other designation. Gartner research publications consist of the opinions of Gartner's research organization and should not be construed as statements of fact. Gartner disclaims all warranties, expressed or implied, with respect to this research, including any warranties of merchantability or fitness for a particular purpose.